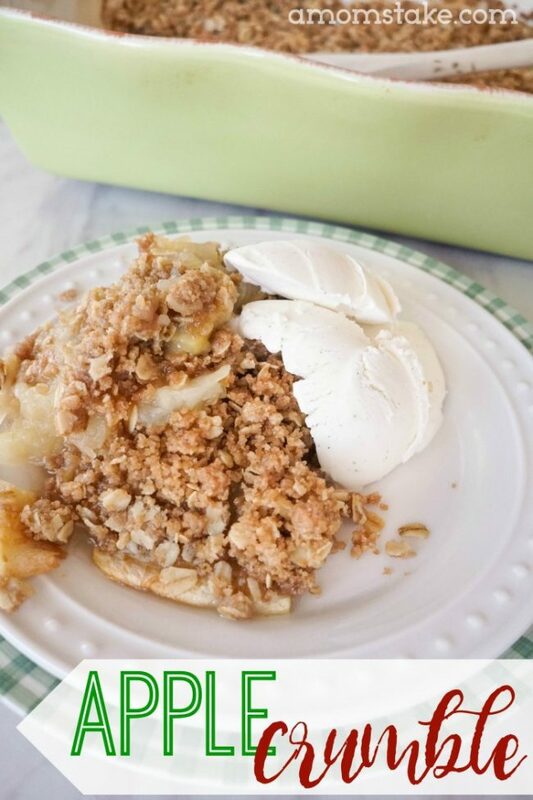 You are here: Home / Easy Recipes / Easy Apple Crumble Recipe – Just 6 Ingredients! 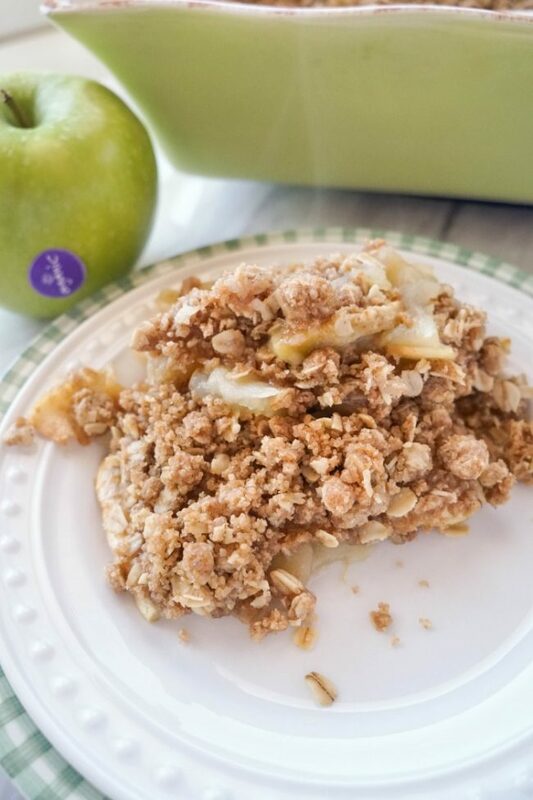 If you love a good apple pie, you need this recipe in your life! 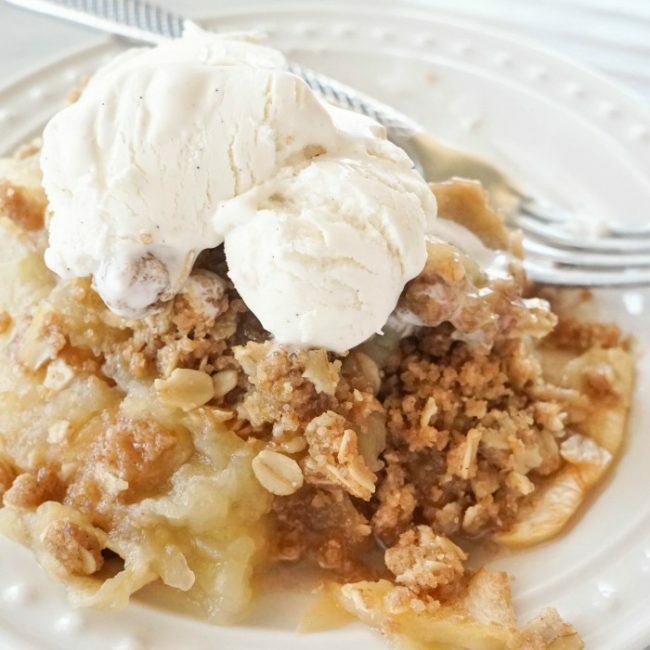 It’s all the yummy taste of a warm apple pie but it skips over all the hard work of making a crust and leaves you with a perfect and easy apple crumble recipe you’re going to love! This post is sponsored by Harris Teeter Organics. There are just two steps to this recipe – mix together flour, cinnamon, brown sugar, oats, and butter to create your apple crumble. Next, prep your apples by peeling, coring, and cutting into thin slices. If you have an apple slicer/corer, you can save a bunch of time, but it’s not required. Either way, this recipe is a cinch to make. But the key to an amazing, unforgettable apple crumble is in choosing the best quality ingredients! A recipe is only as good as the ingredients you add to it. I’m so excited about the full line of organic grocery products available at Harris Teeter grocery stores. The Harris Teeter Organics line has an easy-to-spot purple label that helps you find what you’re looking for quickly among all the options on the shelf. 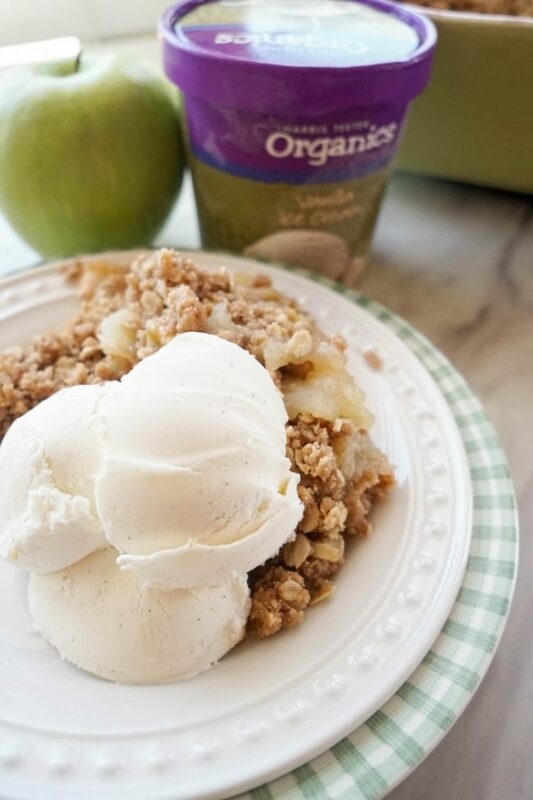 You can take on this family favorite, traditional apple crumble recipe with Harris Teeter Organics for a tart and sweet dessert that tastes like perfection! 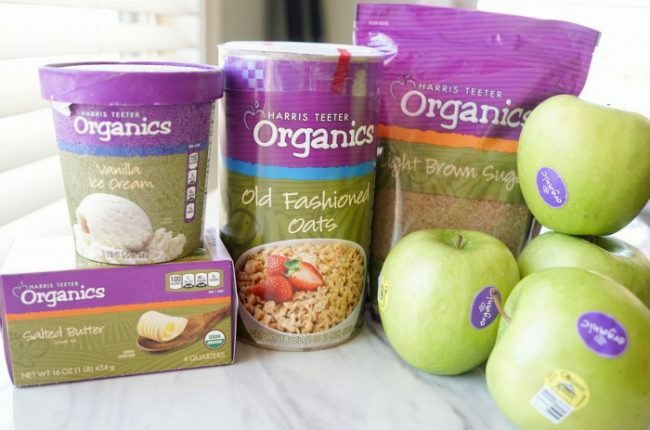 All Harris Teeter Organics products contain NO: GMOs, synthetic fertilizers/herbicides/pesticides, artificial preservatives/colors/flavors, antibiotics, or growth hormones. That means you’re left with just pure, healthy food grown the way nature intended! Combine oats, brown sugar, butter, flour, and cinnamon. Mix together with a fork until combined and crumbly. Peel, core, and slice your apples. If you have an apple slicer/corer this is super fast and easy! Fill 9x13 baking pan with thinly sliced apples, spreading them out in layers until your pan is mostly full. Sprinkle apple crumble on top, spreading it to evenly coat the top of the apples. Bake for 40-50 mins, or until the apples are soft when poked with a fork. Serve with a scoop of vanilla ice cream, if desired, and enjoy! Give your apple crumble recipe about 15 mins to cool (it will still be warm) and then add a scoop of ice cream on top, if you like a la mode. You’ll be scarfing this one down, and be dying for seconds! This recipe reheats really well so it’s great as leftovers, even cold! 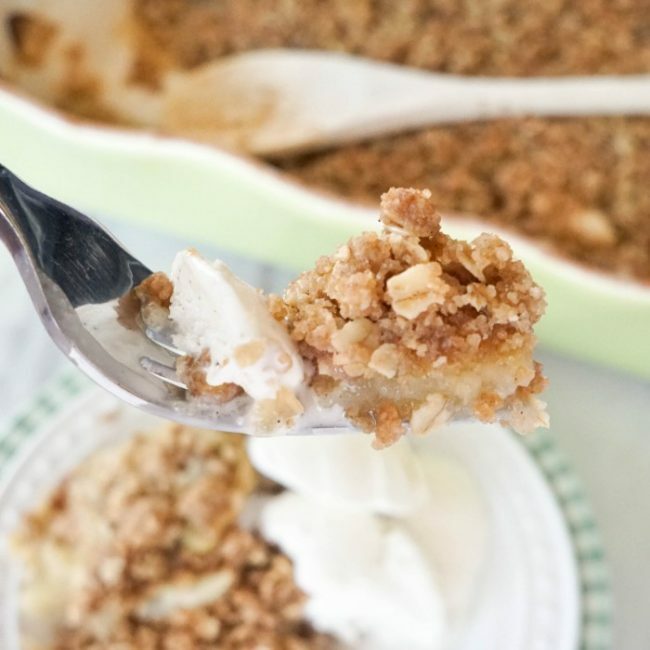 No matter how you choose to enjoy this easy apple crumble, you’ll be glad you made it. Love this recipe? Pin it to save! Can’t believe this recipe only has 6 ingredients to it! It seems so much more complicated because it looks absolutely delicious. I can’t tell you how many different apple crisp/ apple crumble recipes I’ve tried looking for the perfect one. Definitely going to be trying this one out soon! I love a good apple crumble. This would be perfect to serve with Easter dinner. This looks so good! And I love that this is so easy to make! Apple desserts are always such a big hit in our home. This looks like it tastes amazing and would be super easy to make. Yum, this looks amazing! I love having apple crumble. It’s so delicious. I’m looking forward to making this. Yes please! I would so love to dig into some of that goodness, man does it look yummy. I am a sucker for a good apple crumble. I made an apple pie last week and it was very time consuming, that’s why I don’t make them very often. This recipe looks so delicious, I will be making it. I actually prefer apple crumble over apple pie. I used to make it all the time, but I haven’t in years. I’m going to have to get on it. You are totally speaking my language! Anything that’s easy and looks this good is the best thing ever in my book. I can’t wait to try this. That sounds so good! The best part of this recipe is how easy it is to make. I’m all about easy. My son loves apple pie and i have been looking for an easy way to make this for him. This recipe will be the first one I try. That sounds so good. I am super excited to make this for my family. I enjoy easy recipes and this one says make me soon! 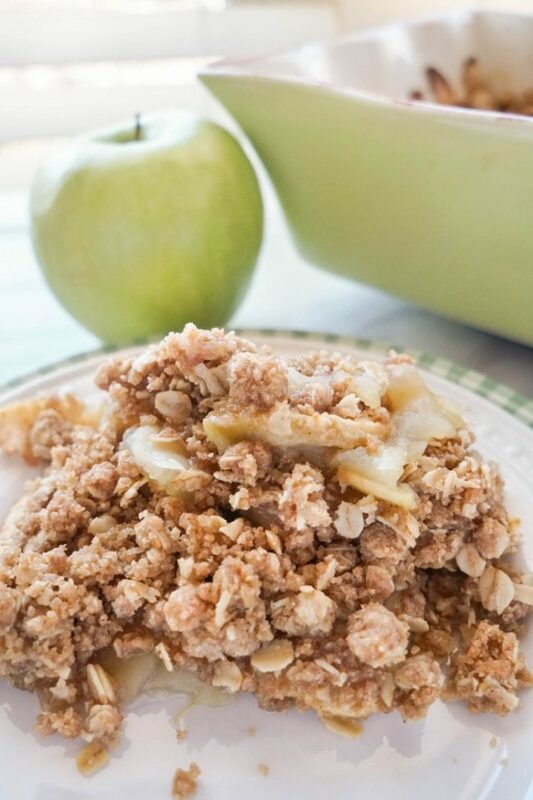 This Apple Crumble recipe looks delicious. Can’t wait to try it.